Toasted sandwiches are yummy, aren’t they? There’s something about toasted bread that just makes it taste a lot better than when it isn’t toasted. Same goes for sandwich fillings, especially cheese which I really love when melted. To go with this weeks post on Toasties, today’s survey is intended to find out which filling is the best. I’ve started the ball rolling with a choice of four, but feel free to add your favourite filling to the list if it isn’t already there. Improvements in technology and in manufacturing processes meant that the seventies and eighties were a time when lots of so-called “labour saving” devices were introduced to our homes. The kitchen was one room in the house that saw quite a few new gadgets come along, and one of those was the toasted sandwich maker. 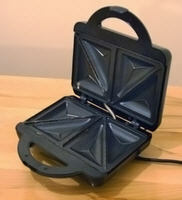 The toasted sandwich maker, also commonly known as a “Breville” in the UK (because that was the name of the biggest manufacturer of the devices, just like Hoover has become another way of saying vacuum cleaner) or simply a “Toastie Maker”, was basically an electric hot plate cooker, but instead of a flat cooking surface it was moulded with triangular indentations that could accommodate slices of bread. To use the device you basically made a sandwich, except instead of arranging the bread so the buttered side was next to the filling, the buttered side faced outwards towards the sandwich maker surfaces. You dumped your sandwich into the toastie maker and closed the lid. The two sides of the sandwich maker compressed the bread around the crusts, creating a seal but normally leaving the crusts poking out the side. Once cooked you carefully extracted the sandwich from the machine, and waited for it to cool down before having a good munch. Moomins are odd looking creatures who most resemble hippos, and were the invention of Finnish artist Tove Jansson. The originally started life in a series of books, the first of which appeared in 1945. This book was called The Moomins and the Great Flood, and it told how the Moomin family came to live in the Moominhouse in Moominvalley. The main hero of the stories was Moomintroll, who was a young inquisitive Moomin who was fascinated by the world around him. His mother and father, Moominmamma and Moominpappa, also featured heavily. Moomintroll had a large extended family who often came to stay, including a female Moomin called, no not Moomingirl or something like that, but bizarrely The Snork Maiden?! Other frequent guests of the Moomins were Snufkin, a wandering lad who played the harmonica, and the frankly scary Little My, who seemed to have a permanent scowl on her face and who got irritated about things very easily. Little My lived almost permanently with the Moomins, and despite being a bit disruptive at times could often be useful to have around. It was the mid eighties (1984 to be precise) when Transformers toys first appeared in toy shops across the world, and they’ve stuck around ever since, becoming one of the most popular toy lines ever. I distinctly remember them arriving, and whilst I never have actually owned one of the toys, I really really wanted to. The reason I didn’t was because I was around secondary school starting age when they appeared, so I felt that they were perhaps a little too childish for me to ask for. That and the fact that computers had become “my thing” so all my pocket money and present requests tended to be directed in that area. Transformers didn’t actually start off with that name however. The original toys were made by Japanese company Takara and were actually part of two different ranges known as Diaclone and Microman. The almighty Hasbro saw these toys and immediately snapped them up, combining both series and rebranding them as the Transformers. Thus the courageous Autobots and the dastardly Decepticons were born. Whoever came up with the original idea for these toys was surely a genius. These were two toys in one, the first being a mighty warrior robot, the second being an object of some other kind. Primarily these other objects were normally vehicles, with the Autobots tending to become cars or other wheeled vehicles, whilst the Decepticons were airplanes. That said, Megatron, the leader of the Decepticons, turned into a pistol! Cheese and Onion are Green! Or is it Blue? When I was growing up, you could always delve into a multipack of crisps containing the three staple flavours of Ready Salted, Cheese & Onion and Salt & Vinegar, and choose the flavour you wanted using the red, green, blue system. It didn’t matter if it was Tesco’s own make or something from one of the big manufacturers, you could guarantee that Red was Ready Salted, Green was Cheese and Onion, and Blue was Salt and Vinegar. The Walkers crisps came along, and just to be different decided to swap the colours for Cheese and Onion and Salt and Vinegar over. Now, quite why they thought this was necessary I don’t know, since in my experience people have a tendency to like one or the other of these two flavours, but not be too keen on the other. For this week’s survey, I’m interested to see how many other people still think of the red, green, blue system as it should be, or as Walkers want it to be? What colour packet should Cheese and Onion crisps be? With crisp behemoth Walkers slowly buying up every other major crisp manufacturer they can lay their hands on, it was inevitable there would be some casualties. To be fair to Walkers, now they own Smith’s Crisps they have at least kept the Smith’s name running as a brand (Walker’s Salt ‘n’ Shake would be sacrilege). Whilst the Smith’s name lives on, we have unfortunately had to say goodbye to the Smith’s Crispy Tube, the tube shaped crisp. 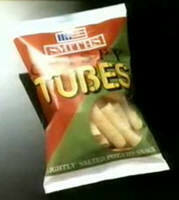 These crisps were long, thin tubes of potato, and I’m still not sure how they managed to make them in the first place. There may be other tube like crisps available, such as the ever popular Hula Hoops or Wheat Crunchies, but the Crispy Tube had a very light, delicate texture these other crisps lack. Crispy Tubes always reminded me of those other Smith’s favourite, the Square Crisp. In fact, perhaps that was how they made them, by taking Square Crisps and rolling them up somehow before cooking them? 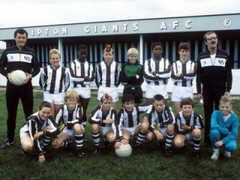 Jossy’s Giants was a BBC kids show about a struggling youth football team, the Glipton Giants, who were managed and trained by ex pro-football Jossy Blair, hence the programme’s name. Now, I’ve never really been a big fan of football, but for some reason I enjoyed Jossy’s Giants. OK, perhaps the show wasn’t entirely about football and was actually more about the kids that made up the team and, of course, Jossy himself, but there was a great deal of on pitch action and cameo appearances by big football names including Bryan Robson and Sir Bobby Charlton. The kids who made up the Glipton Giants were apparently picked not just for their acting ability but also for their footballing prowess, which showed as they did have to play a fair bit of football in each episode and they were pretty good as I recall. Whilst many of the story lines for the show were inevitably about the trials of both the football team and its members (this was a kid’s show after all) a fair amount of focus was also given to Jossy Blair. Indeed it is the plotlines that centred around him that I seem to recall most for some reason, including his run-ins with the manager of a rival youth team, opening up a sports shop and his attempts at wooing a local councillor. For pretty much the entirety of the eighties it was fashionable for women (and men to a certain extent) to wear clothes with shoulder pads in. Initially this trend was mainly confined to suit jackets, but before long it was not unusual to find shoulder pads added to blouses, jumpers and overcoats too. The fad was so popular that even if you bought an item of clothing that didn’t have shoulder pads (say a T-Shirt, although even this humble item of clothing could find itself with added shoulderiness) you could always slip a pair of detachable shoulder pads in to give you that American Footballer look. These pads could be attached with velcro to the bra straps or straight into the item itself. Some garments even came with a choice of interchangeable shoulder pads so you could have merely accentuated shoulders or go for the whole Star Trek Romulan look if that was what took your fancy. The reason behind this fashion trend was primarily due to the rising number of women working in office settings. The eighties were a decade where women found themselves with more choice in how they wanted to live their lives than they perhaps had previously, even in the seventies. In a bid to be treated in the same way as men, the rise of the so-called Power Dressing phenomenon came about, with smart business suits the order of the day. 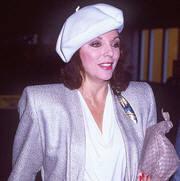 Shoulder pads soon became a staple part of any high flying female’s wardrobe.